Celebrate National Nutrition Month with this one easy, healthy upgrade to your daily diet. 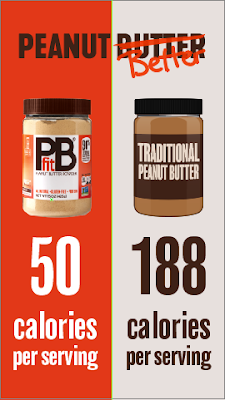 Switch out that fat and calorie laden peanut butter with PBfit. 90% less fat and 1/3 the calories of traditional PB and tastes great!! It even comes in chocolate! Now you can enjoy peanut butter without the love handles with the benefits of this non-guilty pleasure from PBfit!